For edentulous people looking for a low cost solution to restoring their mouth without undergoing bone graft surgery, getting All on 4 implants in Costa Rica can be worthwhile. People opting for All on 4 dental implants in Costa Rica can save substantially rather than getting them in the US or Canada. 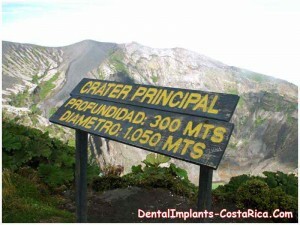 When one thinks of easy on the pocket dental work, Costa Rica is likely to appear in the list of potential destinations. And why not – dentistry in Costa Rica is considered highly cost-effective, thanks to the low cost of living in the country. Spiraling healthcare costs in the US and lack of dental insurance coverage have helped bolster dental tourism in Costa Rica. The Council for International Promotion of Costa Rica Medicine (PROMED) reports that the country received nearly 25,000 medical tourists in 2008. 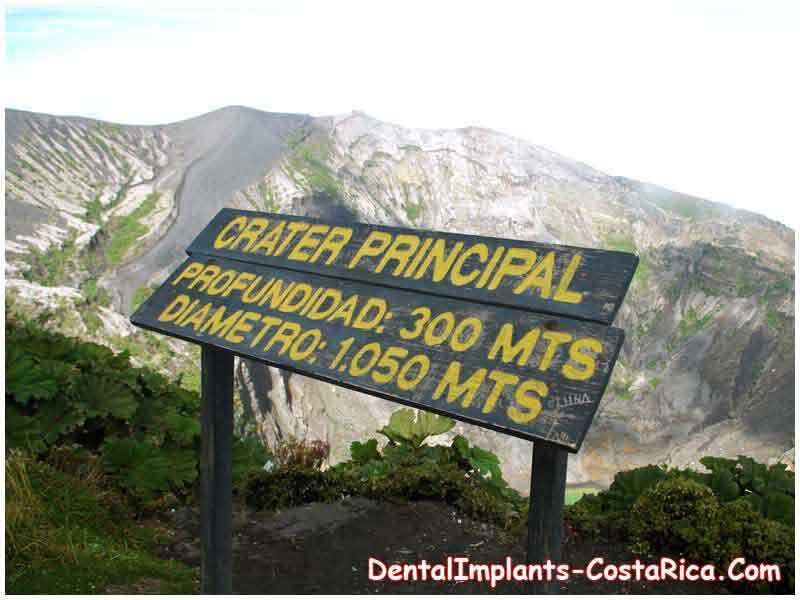 The Council also states that nearly a third of the medical tourists opt for dental treatments in Costa Rica. The All-on-4 implants were developed by a leading European implant dentist Paulo Malo in the late 1990s. 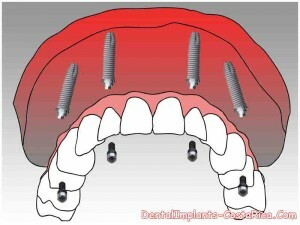 All on 4 implants are highly recommendable for people with compromised teeth, bridges or dentures. These implants are suitable for patients afflicted by periodontal disease. These patients often suffer from considerable loss of bone tissues and hence, do not make good candidates for traditional implants as their worn out jaws cannot support the prosthetics. This is where the All-on-4 implant technique comes in handy. In this procedure the dentist inserts two dental implants towards the front part of the jaws. Next, two implants are inserted angled towards the back portion of the jaws. After the insertion of the All on 4 implants, custom-made temporary prosthetic dental bridge is affixed on to the implants. Those considering getting All on 4 implants in Costa Rica should be glad to know that the procedure gets over within a day. As mentioned, the cost of All-on-4 implants in Costa Rica is much lower than what these cost in the US, Canada and the UK. Costa Rica is home to numerous state-of-the-art hospitals and clinics. Most of the dentists and their support staff in the reputable dental clinics in San Jose, Costa Rica are bilingual, thereby eliminating language barriers. The reputable dental facilities in Costa Rica have the most advanced dental tools and use the latest techniques for treating their patients. So, you’ll know that you will be getting your affordable dental implants in Costa Rica without the dentist cutting corners on quality! There are quite a few JCI-accredited and ISO-certified hospitals in Costa Rica. Long waiting period in your home country might be prompting you to go abroad for getting All on 4 implants. Costa Rica is a big draw among overseas patients as they get prompt medical attention there minus any waiting times. Costa Rica can easily be accessed from most of the American cities by air. It just takes a two-and-a-half hour flight from Miami, and a five hour flight from Los Angeles to get to Costa Rica. Enjoy some of the most beautiful sites in the world while recuperating from your dental surgery in Costa Rica. Avoid consuming any foods that are crunchy, hard or chewy. Get lots of rest and maintain a balanced diet. Refrain from smoking and consuming excessive alcohol. Brush and floss regularly and visit your local dentist to make sure there is no infection in your mouth. If you are contemplating getting All-on-four implants in Costa Rica then you can consider our network dental clinic in San Jose which has been providing quality dental treatments since 1999. The finesse of the dental treatments offered in this San Jose dental clinic can be averred from the fact that it was the first dental facility in Costa Rica to receive accreditation from The American Association for Accreditation of Ambulatory Surgery Facilities (AAAASF) in 2009. PROMED conferred the dental center with its Seal of Quality in 2010. This dental clinic also employs the latest technology, namely SCANORA® 3D and Cone Beam Volumetric Imaging (CBVI) for advanced dental imaging and CAD/CAM dentistry for making dental crowns, veneers, bridges and implants. The San Jose dental clinic boasts of highly experienced and well trained dentists. They are members of prestigious organizations such as the American Dental Association, the American Academy of Implant Dentistry, and the International Congress of Oral Implantologists. Another advantage of getting All-on-four dental implants in the Costa Rica dental clinic is that it has its own on-site dental lab which helps in saving a lot of time. The clinic has English and Spanish-speaking dentists and dental assistants. Keeping in view so many advantages synonymous with getting low cost All on 4 implants in Costa Rica, the downsides to traveling to an entirely new country, such as facing cultural differences and bearing with some language barriers when on the street get surmounted easily.